Lead Shield binds residual lead-based paint and dust present after removal, and accepts most topical coverings as a one-step product that bonds to most surfaces. 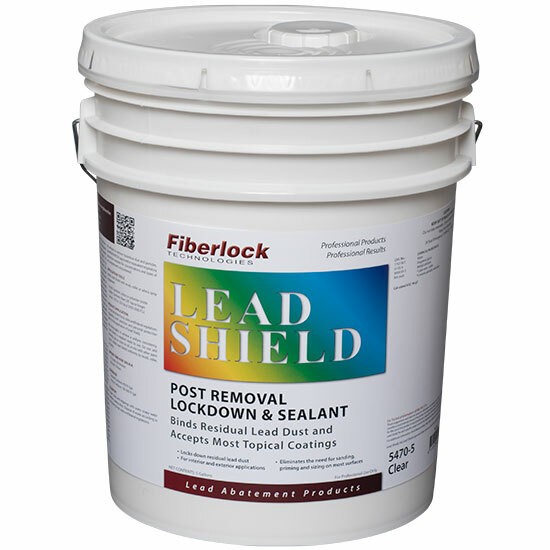 Lead Shield eliminates the need for sanding, priming and sizing recently stripped walls. Use it on both interior and exterior surfaces* to prepare the surfaces to accept a final topical covering. *For exterior applications, LeadShield must be top coated with an exterior grade acrylic coating. Lead Shield must be applied when the atmosphere and surface temperatures exceed 50°F. Surfaces must be free of all surface contamination prior to application of Lead Shield. Patch any irregularities with vinyl patching paste or appropriate patching compound. If chemical strippers were used to remove the paint, follow the manufacturers’ suggestions for surface cleaning before applying Lead Shield. Sanding, scraping and other surface preparation procedures can create toxic dust and hazardous waste. A HEPA (High Efficiency Particulate Air) vacuum should be used on all surfaces to remove hazardous dust and particles. Use MSHA/NIOSH approved or equivalent respiratory protection suitable for concentrations and types of air contaminants encountered. Consult all related local, state, and federal regulations regarding work practices and personal protection prior to the application of Lead Shield. Do not apply when air or surface temperature is below 50°F or when drying conditions are poor. Lead Shield is supplied ready to use. Apply Lead Shield uniformly by brush, roller, or spray. Stir thoroughly to achieve a uniform consistency before selecting one of the recommended application methods below. Mix thoroughly. Do not add solvents, oils or colors in oil, or mix with other paint types. Clean tools and drippings with warm soapy water before Lead Shield dries. Dispose of all waste according to all existing local, state and federal regulations. Store in a dry place at temperatures between 40°F (4.5°C) and 90°F (32°C). Stir thoroughly. Do not mix with any other coatings, solvents or colors in oil. Do not apply when air or surface temperature is below 50°F or when drying conditions are poor. Do not re-coat with coatings using aromatic or other strong solvents. When applying with a sprayer, wear a NIOSH approved respirator with any R, P, N or HE filter. Use adequate ventilation during application.